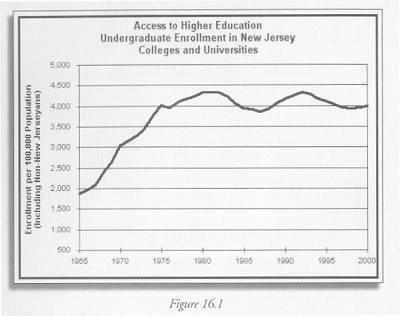 This indicator measures undergraduate enrollment in New Jersey’s colleges and universities as a share of state population. It can be important to sustainability for several reasons. If our higher education systems are strong, we will have a large pool of educated labor in the state, making it easy for dynamic industries such as high technology and pharmaceuticals to locate and expand here. A strong educational system will also offer enough educational opportunity to keep our students in the state, so they can choose to stay in the region where they grew up, rather than having to go elsewhere to be educated and pursue their dreams. There are differences of opinion, however, as to whether the share of enrollment in in-state schools actually measures access, or is simply a reflection of student choice. As Figure 16.1 shows, enrollment per capita has risen since 1965, but has remained relatively stable since 1975. The fluctuations since 1975 reflect change in the economy as a whole. When the economy is doing poorly and unemployment is high, more students enroll in college, whereas when the economy is strong, some students choose jobs over school. A comparison with Indicator 2 on unemployment shows that the fluctuations are exactly the same in those two graphs. The most recent employment downturn occurred in 1998, and students have come back to higher education since then. 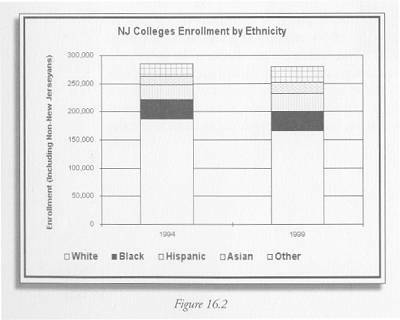 Figure 16.2 shows the racial breakdown of enrollment at NJ colleges and universities. The share of white students in New Jersey colleges and universities, at 65.8% in 1994 and 59.1% in 1999, is considerably lower than their share among high school graduates, which is estimated at 85%. (2) Although we lack full information to know for sure, this may suggest that white students are more likely to go out of state than minorities. It also suggests that the in-state schools are targeting a population that may not have the resources to leave home for college. Without additional data, however, and an explanation of the large “other” category, we cannot be sure whether these hypotheses are correct. Our data are not detailed enough to really answer the questions we are asking about our higher education system. We would like to know who goes out of state, and who comes in, and why they make these choices, to really assess whether New Jersey high school students have access to the higher education options they want.